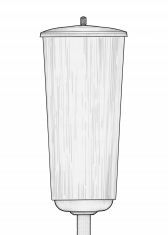 This website contains mechanical drawings of enclosing protective post-top (poles' top mounted) cages and supports for outdoor loudspeakers housing. Optimal mounting height - up to 3,50m, or 12ft, pole's top end. Click on image to ENTER !